As I have mentioned here before, I did not own a computer growing up. As such, outside of a few interactions at school, I did not have the opportunity to experience the wonders of MS Paint for quite a long time. And as primitive as that particular program is now, there was indeed a time when the idea of a free-reign drawing program was groundbreaking; after all, in the MS-DOS days, the idea of using a mouse was a giant leap forward in interactivity. 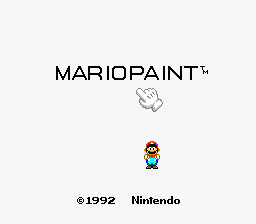 So I suppose it makes sense for Nintendo, the home of perhaps some of the most creative artists, designers, animators, and composers in video game history, to decide that maybe they could put their own efforts into bringing such a program to their own platform, resulting in today’s game, well, “game”, 1992’s Mario Paint for Super Nintendo. 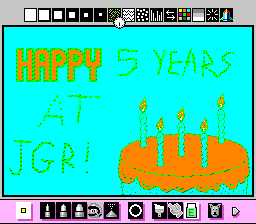 As the name on the tin implies, Mario Paint features a freeform art program very similar in general design to the aforementioned MS Paint. This wasn’t the first such attempt to put such a platform on a home console, but it’s definitely the first to have the full Nintendo machine behind it, which definitely bodes well. In fact, Nintendo went above and beyond to add a great deal of extra features one wouldn’t find right out of the box on a PC from the same timeframe. Aside from the basics, the different pen sizes, the ability to create an airbrush effect, being able to fill closed shapes with colors, being able to draw a perfect circle in the first place(sorry, Etch-a-Sketch), you have a litany of colors, patterns, stamps, language characters (both in English and two forms of Japanese), and shapes to work with, as well as the ability to easily copy and paste objects. Intrepid users can also create their own stamps by the use of an editor that allows you to add color pixel-by-pixel to create the intended image. Of course, there’s more than just still imagery available here. 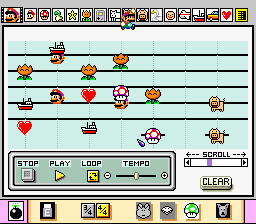 There’s a surprisingly functional music maker program to be found as well, where the user can place notes along the treble clef in a number of different instruments, like guitars, drums, horns, and piano, and even some more unique sounds like the Game Boy beep or a weird laugh-sounding effect. You can write music in either 3/4 or 4/4 time, adjust the tempo in playback, and even create actual functioning chords. Better yet, because of the Super Nintendo’s advanced sound system, the tones and twangs actually sound like actual instruments, not cheap MIDI versions, so you can legitimately create some advanced jams, even if they have to be rather on the short side. So, you can create an image, you can create music, and that’s nice, yes, but it sure would be nice if you could put that image in motion. Well, you can! Mario Paint also packed in a rudimentary animation program, so if you wanted to create a beautiful ocean scene and have a fish jump out of the water, or a car riding down a lonely desert highway, you can do so if you’re so inclined. Now, I said the animation feature was very basic, and indeed it is; you can have at most nine frames of animation, and the more frames you use, the smaller the moving image has to be, but still, remember, this was 1992. If you were a kid around this time, and were interested in art or cartoons, the idea that you could make even a very basic, very simple animation and decide what you wanted it to do and where it would go was probably mesmerizing. However, perhaps the biggest difference between Mario Paint and pretty much every other creative suite, even today, is that Nintendo did their best to jam-pack as much character into this one as possible, and in the process, make even the most boring of processes surprisingly fun. Take the title screen, for example. The most basic white background with “MARIOPAINT” scrawled on it in black, with 16-bit Mario scampering around towards the bottom. To enter the game proper, you click on Mario himself, but clicking the letters themselves also cause different things to happen, like clicking the “O”, which turns it into a bomb with a burning fuse that explodes and blows all the letters around. Even the necessity of erasing an image is more fun then it needs to be, as there are a number of full-screen erasers to choose from, like the rocket that blasts your picture away as it takes off or the water effect that washes the screen clean. Of course, if you made a mistake, you can bring that image back by clicking on the visage of your trusty companion, Undodog. Yes, Nintendo even went so far as to give the undo button a character and a name. On another positive note, you can actually save a project to the game’s internal battery, so you don’t have to worry about your nine-frame masterpiece of a robot man crashing into a building in the dystopian future and the sick soundtrack behind it disappearing forever when you turn the Super NES off, or having to actually record it with a camcorder to show others in the future. In fact, the saving feature is another entertaining quirk, as it manifests itself in the form of a giant machine that takes bits of data and turns them into drips that are safely collected in the game’s memory. On the downside, you can only save one project, and it takes a LONG time to save them; this isn’t quite the era of hitting Ctrl-S to insta-save an image. Oddly enough, tucked away with the save-load feature is a Coloring Book that features pre-rendered images like Mario riding Yoshi in a happy Mushroom Kingdom scene or a Happy Birthday card with a pre-drawn cake and features like candles and roses you can cut and paste onto the cake itself, which is a nice touch, especially for someone just wanting a more casual artistic moment. It should be noted that Mario Paint marks the debut of the Super NES Mouse, which was packed with the game in most cases. The mouse itself made a couple of appearances in the Super NES library, but obviously, this is the game it’s most associated with, and even now, over 25 years later, it still works pretty well. The mousepad it comes with is a little different than what you might be used to; it’s a bit on the large side and made of hard plastic instead of a more frictional material, but it functions quite well for its purpose. The mouse is a basic design, just two purple buttons mounted on a gray box with a trackball underneath, but it’s plenty responsive (and the cursor speed can be adjusted in-game), and still functions just fine today, as you would expect from Nintendo’s quality workmanship. 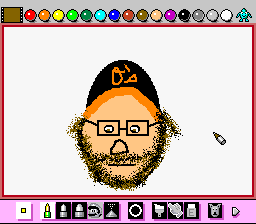 Seeing as I didn’t grow up on computers, Mario Paint was my first actual experience using a mouse, and I suspect this was the case for more than a few people, so kudos to Nintendo for helping introduce this new technology to people who might not have interacted with it at the time otherwise. There’s even a feature in the game that helps teach proficiency with the mouse, perhaps the most well-remembered feature of Mario Paint in general, the famous Coffee Break minigame where you man the helm of a flyswatter and flatten your way across increasingly aggressive waves of insects. Again, how Nintendo is it that they managed to make a minigame designed to teach mouse skills into a classic? While it’s kinda hard for me to really classify Mario Paint as a game, it’s certainly a fascinating concept. For its time, it’s a very complete creative suite that’s both featured enough to make a fairly elaborate work and casual enough for kids to understand the mechanics of, and considering it’s mounted onto a 16-bit gaming machine, that’s a pretty impressive feat. Given that today, most everyone has access to computers, and probably access to creative software, even if it’s just venerable old Paint, you probably will never see something like this ported onto a home console again, except maybe for some kind of novelty factor, so there’s really nothing modern to compare this to. 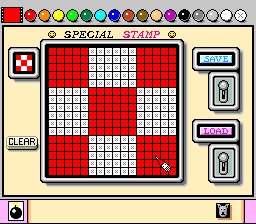 That said, Mario Paint is worth taking a look at if only for the historical value of it, and if you’re interested in art or composing, this is still quite a decent little workshop. If you’re someone who’s been interested in the potential of video games as a medium of creativity, Mario Paint stands tall, even today. A very user-friendly creative suite that’s chock-full of bells and whistles, all topped off with a healthy dose of Nintendo charm. Can only save one project, and saving it takes a bit of time. Not to mention the fact you probably have about as powerful an art program on whatever you’re reading this review on. A revealing self-portrait! Based on the photo of the top half of your head I never imagined that you had a beard. Or is it more of a stubble? I either let it grow out super bushy or keep it shaved down. Also, the shade of brown they has wasn’t quite dark enough to match my actual hair color, so I had to sprinkle some black in there. Still and all, I think it came out better than I expected going in. Mario Party helped solidify that I had no real artistic skills or creativity. I remember enjoying futzing around with the music maker, but I don’t remember actually making anything. I remember making stick-man animations of Mortal Kombat fatalities, but never saving them in case my mother found out. I mostly remember the fly swatting minigame, but not that I was terribly good at it. Happy 5th Anniversary! By now I’d say you’ve contributed as much to defining what JGR is about as any of the rest of us, which means a lot to me. So thank you! I hope it’s been a good time for you as well, and looking forward to another five years! I’ve mentioned this before, I’m sure, but it’s always been a cool feeling for me to think that I visited this site all the time in high school and now that I’m pushing 30, I’m WRITING for that site. I get to contribute to something I kinda grew up with, and that’s mind-blowing to me to this day. 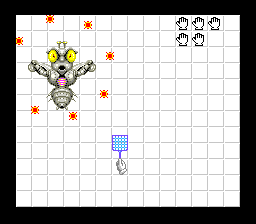 As for Mario Paint, I feel it’s the video game equivalent of an Erector Set: if you were a kid that could build ANYTHING that actually functioned with an Erector Set, you were probably destined to be an engineer. If you were really capable of making quality in Mario Paint as a kid, you should go into the arts.